World's Most Stylish Islamic Swimsuit! Price: Click Size for price. PRICE REDUCED. THIS COLOR ONLY. LIMITED-TIME. GET $40 OFF INSTANTLY, ADD THIS COLOR TO CART FOR INSTANT SAVINGS. No Hood Piece. 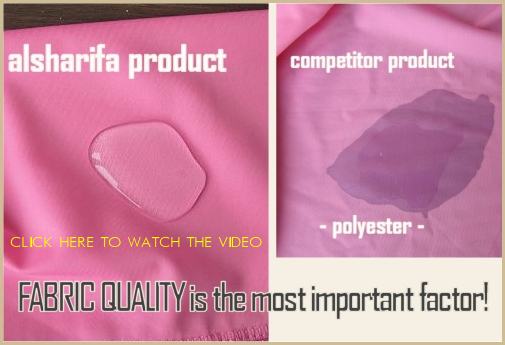 Water Resistant Fabric. For young Girls ages 5 to 8. This style is for PETITE WOMEN, GIRLS, and JUNIORS. It features a shorter inseam. "Excellent product! I've purchased other swimsuit products before but found this to be the best. The material was light weight and the hijab hood fit comfortably. Also, the sizing matched what was listed on the web - a definite plus! The only criticism was the pants were a little long, but it was easy enough to make it shorter. This is a great product with great service - I definitely recommend it!.." Click here or on photo, below, to watch the video.